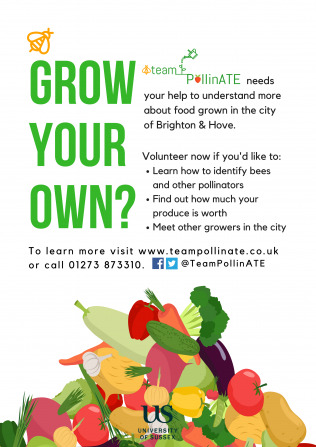 Team PollinATE is a citizen science project for gardeners, run by scientists at the University of Sussex. If you grow your own fruit and veg, why not sign up to volunteer and help us to learn more about the importance of pollinators for food grown across the city. To find out more, please visit our website www.teampollinate.co.uk or call our project co-ordinator, Beth Nicholls on 01273 873310.